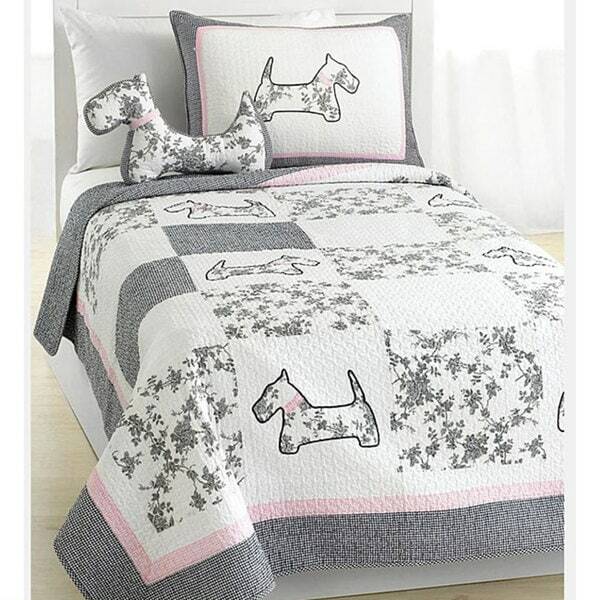 This three-piece cotton quilt set will add some cheer to your child's bedroom with its cute Scottie Pup patchwork design. The white and grey quilt features pink accents and a sweet floral print in the squares. The bedding set is constructed from 100-percent cotton and offers lightweight all-season warmth. It seemed so hard to find a cotton breadspread/quilt for my grandchildren's room. Since I have both a granddaughter and grandson, I needed something that wasn't too girly or all cars and spaceships. Overstock had the best selection that I saw either at local department stores or online. I am very pleased with my purchase and hope my little ones enjoy it as much as I do. Well, Overstock has done it again....Above and Beyond my expectations....These Scottie Pup Twin-size quilts are just Beautiful. Very well made and something my girls can grow up with and keep well into their teen age years and beyond... The colors are Great also. Thank You Overstock. I order all my quilts from Overstock, because I know I will have something Beautiful at a price I can afford. Adorable bedding set for girls of any age! My college aged daughter and her roommate bought these for their dorm room. Nicely made, medium weight quilt. Colors are muted grays and pink on white. Shown with accent pillow that is NOT available...would have loved to have it! Great price for set. We really love this quilt. My middle daughter is very soft and sweet and loves dogs. This bedspread fit her perfectly--we are both very pleased with the colors, design and quality. This is a darling set. The fabric is soft and a nice weight. This is a quality product. The dog toy does not come with the set. i bought this for my granddaughters room. It is so cute. The Scottie pup pillow was out of stock. Wish I could have got it. It is still cute though without the accent pillow. Very cute! I painted my little girl's room pink to go with the pink collar on the dog and it is so adorable! Get the pillow too! This is such a cute quilt, although, I wish the cute little stuffed pup was included, would have been perfect! This quilt set is sewn very well! It's well made and beautiful! I Love it! As a Scottie Mom, I proudly show it off. My sister is jealous; she loves it! Very well made. Would recommend unhesitantly for both the price and quality of workmanship. This is the second quilt like this I have bought. They are beautiful. My only complaint is that I wish the queen was a bit larger or that they had a king size. My first one has held up well. Looks brand new. Colors are still crisp and bright. Has held up very well after washing. So cute, wish they had the scottie pillow to go with it. This set wasn't easy to find so was really glad to find it on Overstock. Came in great condition! Love my little scottie quilt! Washes well. Really cute. This exceeded expectations. Beautiful quilt for my daughters room. Excellent quality. I would definitely buy this again. Washes and dries well. "where can find them Dog-shaped pillow"
Unfortunately the dog shape pillow is not available at this time. "The description states the quilt is pink and grey, but it looks like there is black in there as well. Is that the case or is it just the way the color appears on the screen?" In my opinion, this quilt is pink, grey, and white. "I ordered the scottie pup quilt set but I want also buy the scottie pup shape pillow what show on the picture? Do you sell the pillow seperate ? where I can buy ? iwona"
Hello iwona, we do not currently have the dog pillow available on our site. We do get new inventory daily so please check back soon. Thanks for shopping with us! "How heavy is this comforter? We need a lightweight comforter. We live int the tropics." Hello cozgirl, this is light. The shipping weight is approximately 8 pounds. Have a great day! It is so beautiful, and I know my grandkids will love it. "Are there any sets that coordinate with this? I'm trying to get sets for bunk beds that aren't identical, but coordinate." Hi rebobinar, unfortunately we do not offer a coordinating quilt set made to accommodate this set. We recommend browsing our selection and choosing one you feel can best accommodates this set. We hope this helps. Thanks for shopping with us. "As a previous customer asked, and the answer did not address, does the stuffed animal pup come with the set. The stuffed animal is pictured in the ad but not mentioned anywhere. I would like to know where to purchase the stuffed animal to go with the quilt set. Thank you." Hello joann7977, This does not include the stuffed animal. I'm sorry we do not sell the stuffed animal on Overstock.com. Thank you for shopping with us!